Andy H: More from Secret Wars this week. I was a little unsure how I felt about Old Man Logan when it was first listed but I have to say, I really enjoyed #1, so it looks like I shall pick up #2 this week to see if it can continue to hold my attention. There are a few other #1s from the Secret Wars stable released this Wednesday but I think I'll go with Thors # 1 as the leader of the pack. 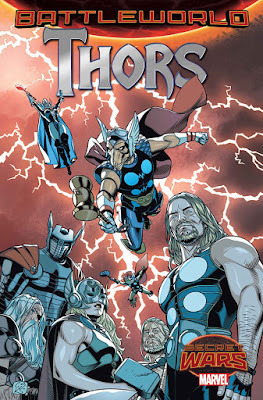 Written by regular Thor series scribe Jason Aaron it should be in safe hands. Shame it's so soon after the reveal of the new Thor's identity but nonetheless, I'm sure it will be worth a try. Of course it helps that top talent Chris Sprouse is on art duties! Over at DC there's a new Harley Quinn miniseries. Harley Quinn And Power Girl tells the missing adventure that took place between panels of Harley's regular series. The first issue of a new Justice League Of America series will be on my 'to check out' list. Bryan Hitch is writer and artist and I hope to see him on top form for this. I'm slightly disappointed that DC have priced this at $5.99 when my pocket money is already stretched! I'll also be picking up Trees #9, Black Canary #1 and of course, Archie Vs Predator #3 (well I couldn't leave that out could I?). All in all some great stuff to look forward to. Stewart R: I've done the research, crunched the numbers and cogitated on the finer details and come to one conclusion: no Marvel in my pull-list this Wednesday! I've stalled on Moon Knight for now, the Cullen Bunn arc not hitting the standard set by Brian Wood and Warren Ellis before him. 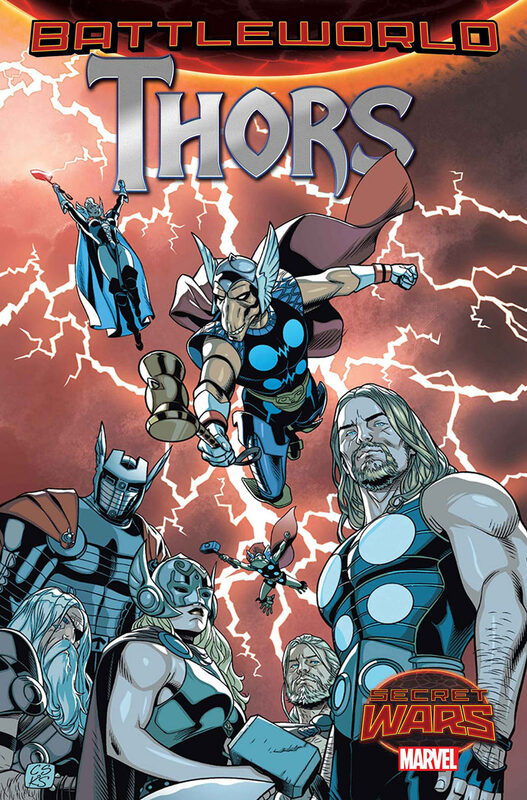 I have no interest in the two new #1s tied to Secret Wars; yes I've enjoyed Thor under Aaron's hand, but can't bring myself to get excited by a Thor-based police force book and I've never had an interest in Runaways. This therefore brings about a strange situation when I have one book to buy from the Big Two and it turns out to be a DC title! My money will be spent on Robin: Son Of Batman #1 as Patrick Gleason makes the transition from artist to writer/artist through the natural progression of his and Peter J. Tomasi's work on Batman And Robin. Gleason captures the visual style of Gotham and its inhabitants like no other and I'm eager to see if his scripting can match his pencilling. Elsewhere, it's the standard dominant performance from Image with the wolf's share of my interest finding its way to their works. Southern Bastards #9 is sure to be a compelling read as the surprise events of that memorable first arc seed further tension in Craw County and I have to say that I've no idea where Rick Remender is gonna take things in his underwater tale of hope in a sea of despair with Low #7, but there's no way I'm missing out!